https://panopticlick.eff.org/ , aka "How unique and trackable is your browser". For example it usually gives me a unique score. The biggest entropy values come from navigator.plugins and fonts via java and flash, but the linked pdf also points out that disabling these common plugins actually just adds to the uniqueness, as well as simply altering the User Agent. Font detection is also seems possible via css introspection. What steps can one take, what technology options do exists to counter-measure fingerprinting of one's browser? or having a really awkward navigation. Assuming that you can use Tor or a VPN or an openshell anywhere to tunnel away your IP address, the "safest" practice in my opinion would be to fire up a virtual machine, install a stock Windows Seven on it, and use that for any privacy-sensitive operation. Do not install anything unusual on the machine, and it will truthfully report to be a stock Windows Seven machine, one among a horde of similar machines. You have also the advantage of the machine being insulated inside your true system, and you being able to snapshot/reinstall it in a flash. Which you can do every now and then - the "you" that did all the navigation before disappears and a fresh "you" appears, with a clean history. This can be very useful, in that you could keep a "clean" snapshot and always restore it before sensitive operations such as home banking. Some VM's also allow 'sandboxing', i.e., nothing done in the VM will actually permanently change its contents -- all system changes, malware downloaded, virus installed, keyloggers injected, disappear as soon as the virtual machine is powered down. In my opinion, not only would the total amount of work be the same (or even more), but it would be a much more complicated and less stable kind of work. Install the most common OS, keep to the bundled browser and software, resist the temptation of pimping it, and what's to tell that machine apart from literally hundreds of thousands of similar just-installed, never-maintained, computers-are-not-my-thing machines on the Internet? Now I have installed a virtual Windows 7 machine, even upgraded it to Windows 10 as Joe Q. Average would do. I'm not using Tor or VPN; all that an external site can see is that I'm connecting from Florence, Italy. There are thirty thousand connections exactly like mine. Even knowing my provider, that still leaves around nine thousand candidates. Is this sufficiently anonymous? It turns out not to be the case. There might still be correlations that could be investigated, having sufficient access. For example I'm playing an online game and my typing is sent straight away (character buffered, not line buffered). It becomes possible to fingerprint digram and trigram delays, and with a sufficiently large corpus, establish that online user A is the same person as online user B (within the same online game, of course). The same problem could happen elsewhere. When I surf the Internet, I tend to always hit the same sites in the same order. And of course I hit my "personal pages" on several sites, e.g. Stack Overflow, regularly. A bespoke distribution of images is already in my browser and is not downloaded at all or is bypassed with a HTTP If-Modified-Since or If-None-Match request. This combination of habit and browser helpfulness also constitutes a signature. Given the wealth of tagging methods available to websites, it's not safe to assume that only cookies and passive data may have been collected. A site might for example advertise the need to install a font called Tracking-ff0a7a.otf, and the browser would download it dutifully. This file would not necessarily be deleted upon cache clearing, and on subsequent visits it not being re-downloaded would be proof that I've already visited the site. The font could not be the same for all users, but contain a unique combination of glyphs (e.g. the character "1" could contain a "d", "2" could contain an "e", "4" could contain a "d" again - or this could be done with rarely used font code points), and HTML5 can be used to draw a glyph string "12345678" on an invisible canvas and uploading the result as an image. The image would then spell the hex sequence, unique to me, 'deadbeef'. And this is, to all intents and purposes, a cookie. completely re-snapshot the VM after each browsing session (and reset the modem when I do). Keeping always the same VM wouldn't be enough. use several different virtual machines, or browsers, as well as well-known proxy services or Tor (it wouldn't do for me to use a proxy that's unique to me, or for which I'm the only Florence user, for anonymity purposes). routinely empty and/or sanitize the browser cache and remember not to always open, say, XKCD immediately after Questionable Content. adopt two or more different "personas" for those services I want anonymity in, and those I don't care about, and take care to keep them separated in separated VMs - it only takes one slip, and logging to one believing it's the other, for a permanent link to possibly be established by a savvy enough external agency. Which also goes to show that I'll better have a good reason to want anonymity: because achieving it reliably is going to be a royal pain in the rear end. BUT, you will always be fingerprinted and identified in some way. It is because you normally connect from the same subnet, and you use the same browser. So to avoid these two, is really hard, because you would need VPN servers on endless number of networks, as well User-Agent generator, and header obfuscation, which does set different values each day, or each time you start it. I for myself, I use Amazon EC2 free micro instance with free OpenVPN server, and it does self-stop and self-start every day in different region (by itself, it boots new server with a script to set it up thru AWS API), and updates DNS via Route 53 API. It is using SQUID as proxy, and there are many rules to block advertising, tracking as well some other things. It has also full BGP table, as these VPN servers are working in the network, but you dont need this, if you are not making cover-up. You can also make EC2 instance change it's IP address without actually rebooting it. You can use AWS API to release Elastic IP and allocate a new one, and add to it. If you change User-Agent at the same time, you will avoid fingerprinting. And indeed, with different IP number and user-agent every day, Google cant recognize me, so I can see ads which are not "tracking me". ps. When you add new instance, you need at least 20GB of EBS root volume. Then you just do yum install squid or apt-get install squid, configure it thru /etc/, and there you go. If you want to change IP address, just change Elastic IP on it - it does work in both ways - the way you can access new instance or you get to the internet. I could produce maybe AMI image, which would work automatically. Simply you just launch instance, it setups OpenVPN, and thru AWS API it would configure IPs, DNS as well SQUID etc. Maybe there are some AMIs at Amazon already. Some websites will complain that you work over VPN. For example, some sites which serve music or video. While most of sites works OK, there are just few exceptions. The technical requirement for avoiding any form of browser fingerprinting is that all potentially identifying characteristics returned by the browser are randomized, so that the probability of the browser returning a certain set of characteristics approximates the probability of observing that set of characteristics in the browser population within which we want to maintain anonymity. Breaking this down, suppose we are only dealing with a single characteristic (say the User-Agent header) and we want to ensure we remain anonymous. For illustrative purposes, let's assume that there are 50 possible values for User-Agent, numbered 1 to 50. 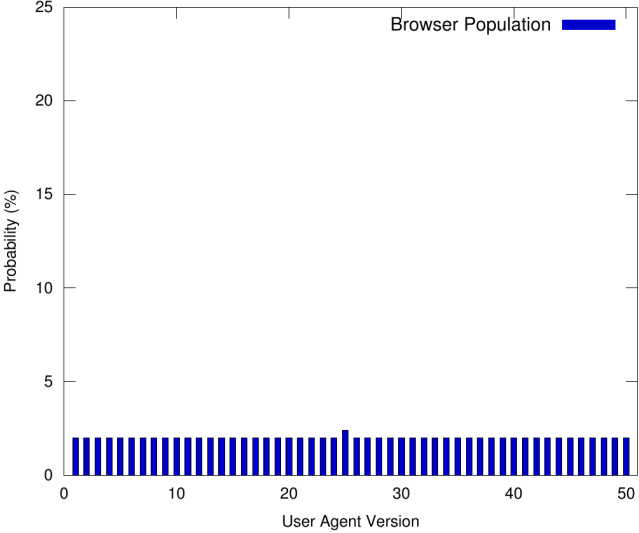 According to the figure, the most commonly occurring User-Agent value in the browser population is only slightly more likely to occur than the remaining values. If we simply used the most common value (25), a fingerprinting service could (consistently) infer that we belong to the (relatively small) subset of 2.4% of browsers in the population. Thus, we have compromised our anonymity. 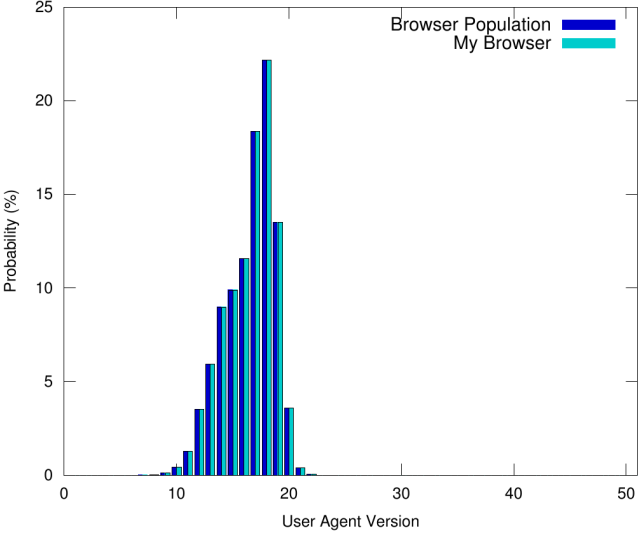 According to the figure, the values of User-Agent returned by our browser are (uniformly) randomised. However, since the values never occur in the population, a (moderately sophisticated) fingerprinting service in this case could consistently infer that our browser type is rare--this is itself a potentially identifying characteristic! Thus, anonymity is compromised. 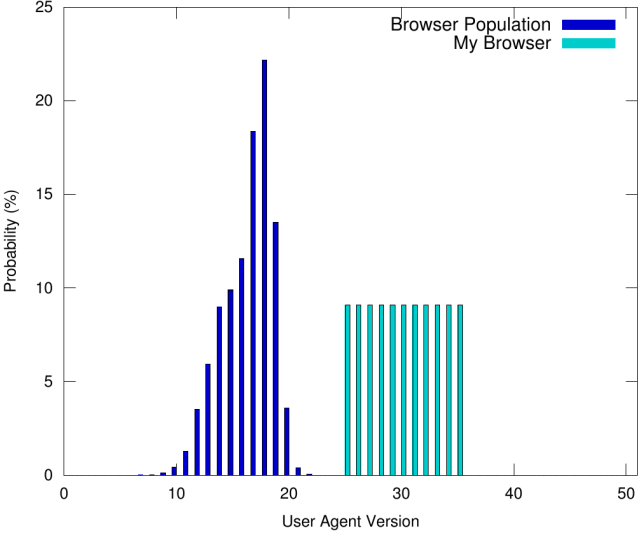 By ensuring that values of User-Agent returned by our browser are randomized so that the probability of each value matches the probability of observing that value in the browser population, we never commit ourselves to identifying with a particular subset of the browser population, while ensuring that our browser doesn't use any rarely occurring User-Agent version. In this way, anonymity is maintained. In the real-world scenario, where there are many potentially identifying browser characteristics, to maintain anonymity note that it is not sufficient to ensure individually for each characteristic that the probability of each value matches the population probability: we may risk returning rare combinations of values, thus compromising our anonymity; this may ultimately result in our browser being uniquely identifiable! Rather, it is necessary to apply the above considerations to the joint distribution of browser characteristics in the browser population, i.e. the probability of observing values for sets of browser characteristics. Todays used fingerprints mostly rely on generating as much entropy as possible by exploiting as much details of the browser as they can. Even subtle, but short term stable details, like the exact (hardware and driver version dependent) rendering on a canvas is exploited. The information gathered is most likely compressed by generating a long enough hash value depending on all the details, eg. by adding all details to a long string or actually drawing something depending on the details into a canvas and apply a hash function to it. However, as long as the information is compressed and not stored in full, the fingerprinting can be defended by frontal attack: Instead of trying to make the fingerprint as non-unique as possible, one can just try to make it as unique as possible, eg. unique per connection. To circumvent this attack, the fingerprint would have to be fuzzy enough to go around the random parts, which means it can not hash the data as a whole and a lot of information would have to be transfered and stored. Circumventing the attack by masking out the random parts would mean only use details the web pages also strongly rely on, which would need permanent adaption of the fingerprinting algorithm. The amount of necessarily non-random details will be somewhat limited by standardisation. However, it may still allow unique indentification if selected properly. The panopticlick site has "self defense" recommendations to avoid tracking. One of the recommendations is to use the torbutton. The torbrowser design docs have a good description of how they try to avoid browser fingerprinting and tracking. All of these approaches are trying to normalize your profile to look like as many other people as possible. P.S : didn’t notice the question was old till late. I can help with what I know. The EFF have an article describing some tools here. Canvas Defender this plugin will hide your canvas fingerprint by adding a random hash to the canvas fingerprint of your browser at each new session or by your request, this will give the tracker a false fingerprint instead of blocking it(blocking it will make you standout the crowd). User-Agent Switcher for Chrome use this tool with Canvas Defender to hide more in the crowds this plugin will let you change your user agent, so if you use linux or a rare used browser you can hide. Flashcontrol as it's called this one will block any flash content unless you allow it,outdated flash can be used to track you or worse hack you. Disable WebGL this tool will help you to hide your real WebGL fingerprint (it will provide the tracker with 0000000000 fingerprint, however this will make you standout) the creator of the tool didn't create it to hide but simply to block WebGL features as it caused his browser to crash. Last thing, using this tools may make your browser un-usable at first so you have to spend some time tweaking them to best meet your goals. Companies use finger printing partially to get rid of click fraud. AudioContext is a very strong finger printing tech, but is not widely used yet. You'd currently need to build a browser from source to get rid of it. If you dislike finger printing, one of the things you can do is use an iOS device (in private mode), since the iphones will all tend to look similar and Apple has built in some privacy protection. Google is at the other side of things, they are researching how to use the pattern of walking to identify users for advertising. Google Analytics is the most pervasive script & cookie (see the other answers), so I try to avoid Google as much as possible (use Startpage.com). If you are concerned about privacy, vote with your feet. Be especially wary of news and media outlets that use finger printing to tune content to your browsing behavior, freedom (as in democracy) is at stake. There should be a W3 institute that helps both sides. Reduce click fraud (bots) and protect privacy. How do websites recognize visitors? Is it possible/does there exist a website tracking mechanism besides cookies? How os fingerprinting works and how to prevent it in browser? Does google use browser fingerprinting? Does using incognito mode protect from browser fingerprinting techniques?